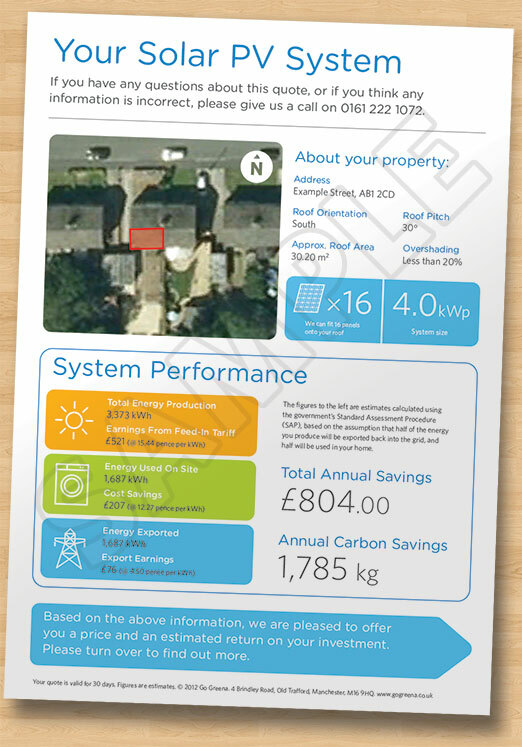 We’ve started sending out our new-look solar panel quotes to our customers this week, and we’d like to know what you think of the new format. Below is an example of what the quotes look like. A sample of a PV solar panel quote from Go Greena. Click the image for a bigger view. As you can see, the quote includes an estimate of how much power you can produce, how money you can make and how much carbon you can save, along with a detailed break-down of the feed-in tariff, export eanings and electricity savings. We would also send you a tailored price for your system and an estimated return on your investment — in other words, how soon your solar PV system would pay for itself (which we discussed in this article). A solar panel quote is completely free and no-obligation, so if you are just the least bit curious to know how much money your house could save, you can request your very own tailored quote here. Article: Are Solar Panels Worth The Investment? Previous PostPrevious Are Solar Panels Worth The Investment?